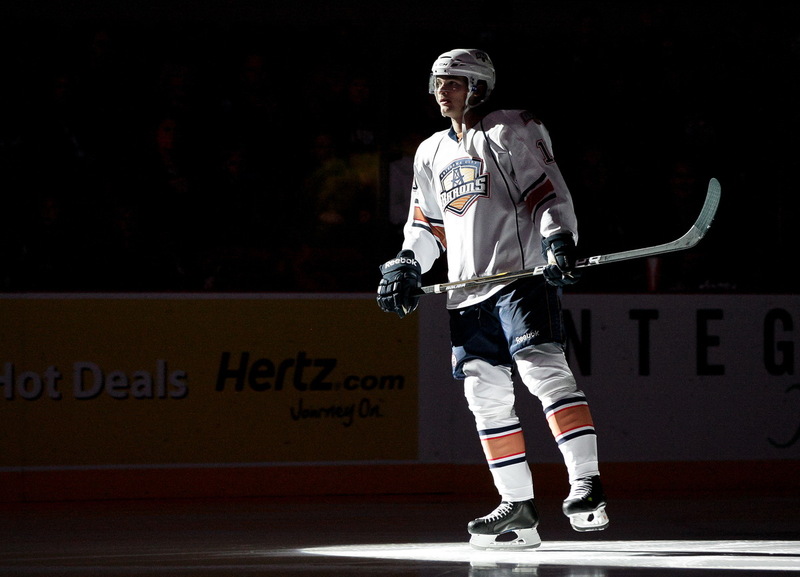 For OKC Barons fans, Teemu Hartikainen will forever have his place in team history as the player who scored the first two goals for the new AHL franchise in 2010 on October 9th vs. the Houston Aeros and October 10th vs. the Chicago Wolves. 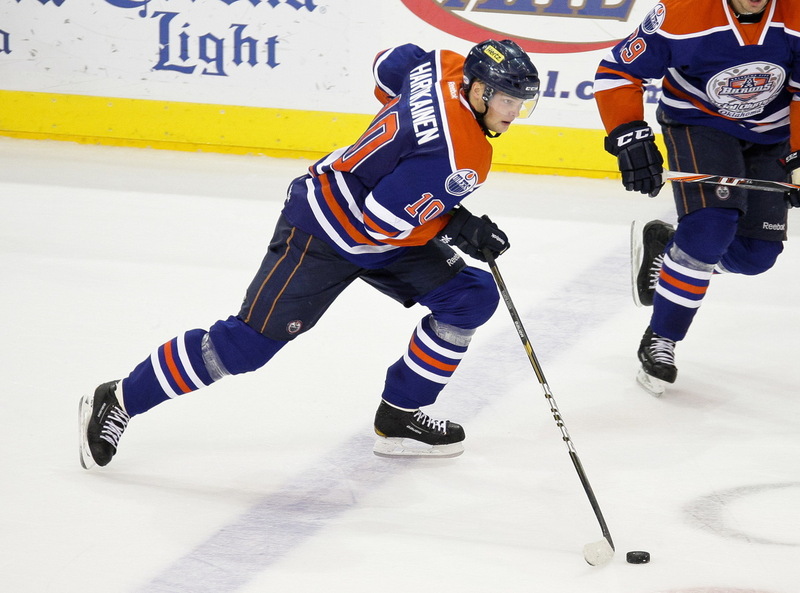 Last season Hartikainen also made a mark while playing for the Edmonton Oilers in their April 1st game vs. the Anaheim Ducks for the Ducks’ final home game. Hartikainen not only had his first 2-goal NHL game that night, but he also faced his idol Teemu Selänne, and with a twist of Finnish fate, both Teemus scored goals for their teams that night. PT: You grew up in Kuopio, Finland. Please tell us more about your hometown. Hartikainen: I was born there and I’ve lived my whole life there. Kuopio is about 100,000 people, so the town is pretty small. Everyone knows each other and I know a lot of people in the town and it’s nice to go everywhere. You know people everywhere. I like it. It’s not too big. We have a summer place about 40 km, about 30 miles, from my home town, and it’s in the middle of nowhere in the forest. That’s so nice. I like both places. For hockey, they have a good hockey team in the town and a lot of junior teams. The big team is called KalPa [Kalevan Pallo]. I grew up playing with the same team until I was 18 and I got the chance to play with the big team and it was great for me. PT: Why hockey? What caught your interest about hockey? Hartikainen: I was six years old when my big brother started to play hockey. I went with him and started to play on junior teams. I started to play soccer too when I was young and I was pretty good in both sports. We lived on this street with a lot of young kids and we played street hockey. I started to be a little better in hockey and it felt more comfortable with my body and it was a more aggressive sport. When I was 12 or 13 they asked me to come to the first group playing in the juniors in soccer but I decided to go into the first group with hockey. It wasn’t even a big decision for me because I knew already that I was going with hockey. PT: Who are your favorite players and team? Hartikainen: Two hockey players from my hometown had been playing in the NHL – Kimmo Timonen and Sami Kapanen. I grew up watching those guys and we saw them once in a while at the rink and during the summer in the city, and it was a big thing to see them. Those were maybe the two biggest guys. And of course Teemu Selänne and Saku Koivu. Those two were very big as well in Finland. PT: What hobbies do you have – other than hockey? – I hear you like to hunt and fish in Finland. Tell us more about that. Hartikainen: Yes, I hunt and fish. Usually I don’t have much time anymore to hunt because the season starts around the 20th of August so I probably have 2 to 3 weeks to hunt. But this year I had a little bit longer – I had almost one month to hunt. When I was younger I hunted a lot, almost every day when I had a chance I went to the forest or the lakes for hunting and fishing. PT: Do you travel far to the north? Hartikainen: No, you don’t have to go way north. About 30 miles, 40 miles from Kuopio and you can hunt and fish. I like fishing a lot during the summer. We have so many lakes and such good fish. My dad and I bought a new boat two years ago. PT: What do you hunt? Hartikainen: Ducks, rabbits, and we have a bird in Finland, a really big bird, black – I don’t think you have them over here. They live in the forest and it is really hard to shoot them. Sometimes I hunt pigeons, or fairly small animals. If you are hunting deer or moose in Finland you have to get a license and it’s not worth it especially now when I don’t have time to hunt and that season starts in October or November. I’m limited. So, usually I hunt ducks. That’s fun and easy. PT: How would you describe yourself – what kind of person are you? 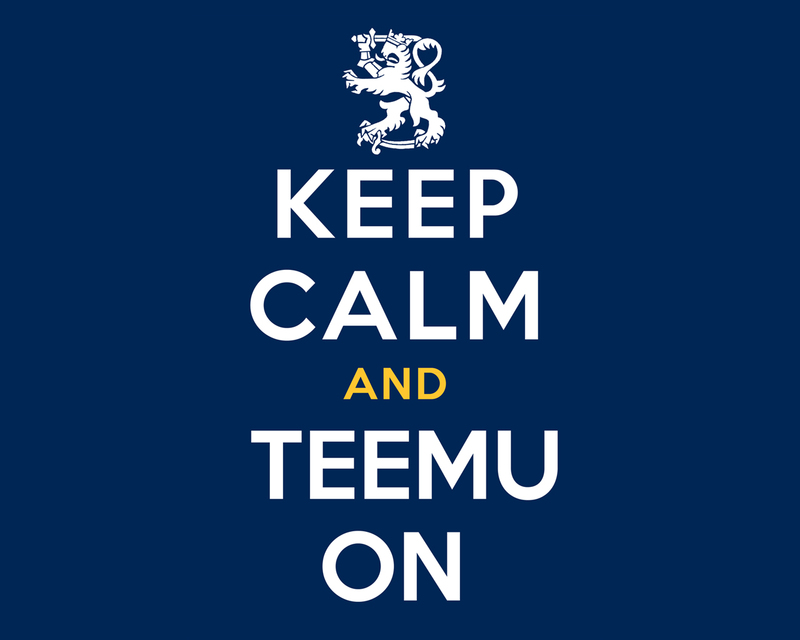 Hartikainen: Well, when I want to do something I do it really thoroughly. If I want to learn something I go all the way. I am a very relaxed person. I like to joke around and hang around with the guys. Like I said, I’m not too tight. I don’t take life too seriously. I like to live my life. PT: Do you have a hockey nickname? We’ve seen Härski – is this a shortened version of your name, or does it come from the film character Härski Hartikainen from the Finnish series of films? Hartikainen: Yes, it’s the film character from the late ‘80s and early ‘90s and he was portrayed by this really famous Finnish actor [Spede Pasanen] who did comedy. It’s kind of common if anyone has the last name of Hartikainen to have “Härski” as their nickname. PT: Does the team here call you Härski? Hartikainen: Usually it is Harti. It’s easier over here. Nelly [Coach Todd Nelson] says Härski, but the team says Harti. PT: You were drafted in 2008 by the Edmonton Oilers – 6th round, 163rd overall. Did you expect to be drafted by the Oilers? Hartikainen: I was expecting maybe a late draft pick but I didn’t really see it coming. It was kind of hard for me. It was a tough season the year before I was drafted and of course I was drafted, but I didn’t expect too much that year. I was expecting that I would not get drafted, or maybe I would be drafted the next year. It was a good surprise when the Oilers drafted me and I was really happy! PT: What off season training did you do to prepare for this season? Hartikainen: I didn’t work out any with my hometown team. I had a guy who was helping me with more skating stuff, not so much long bike rides, but more heavy lifting and things like that. PT: How do you describe yourself as a hockey player? You are a forward—but tell us more. Hartikainen: I’m a power forward. I like hitting, driving to the net, in front of the net in a power play, screening the goalie and usually I score a lot of my goals from two feet in front of the net. It’s kind of a grinding forward. I try to play a simple game but in the meanwhile I have been trying to learn how to pass the puck and find those open line mates and I think all the time I am getting better at that and reading the game. I am getting more and more assists every season and that’s good. And I am trying to develop those other things as well, overall to be a good player but mostly a power forward and I try to make room for my line mates scoring those dirty goals and hitting guys. PT: Last season after playing with the Oilers you returned to OKC a much tougher, grittier player and you really seemed to be in your element — a style in which you seemed very comfortable. Tell us about that transformation. Hartikainen: Well, I have been playing here two years. When I first came over here I kind of expected that I would just have to score a lot of points, be the best guy in the stats, and then I got called up. It was a good year but it wasn’t like my own game, what I used to play back in Finland. Last year I started to be a skill player a little bit more but they pushed me – “you keep playing like that, keep hitting, going to the net, it’s better, it looks better and we need it more than anything else.” Then I started to feel that myself as well, that they don’t have players like that and I can do this stuff very well. It makes me play better and I feel I am hard to play against. I kind of found myself too, and I needed a lot of help from the coaches in Edmonton and down here they’ve been helping me a lot and especially Nelly. Last year, after every game, he’s telling me how I’m doing, keep doing what I’m doing, and I got a lot of confidence from that. I kind of found myself. What kind of player I can be if I want to play in the NHL. PT: Overall, you have played 29 games with the Oilers (with 5 goals and 5 assists). Last season you played 17 games with the Oilers – and in the April 1st game against Anaheim you scored both Oilers’ goals in their win over the Ducks (2-1). First, let me say that was amazing to watch – you scored the first goal 15 seconds into the game, and the second came at 6:04 into the first period. Tell us about that. You probably still remember it well! Hartikainen: [laughing] Yes, it’s a very good memory! The first time I played against my idol Teemu Selänne. PT: Yes, Selänne and also Saku Koivu! Two of the all-time top Finnish players! Selänne has spent 19 seasons in the NHL, with 1341 games, and 663 career NHL goals so far and he turned 42 this summer. Saku Koivu has spent 16 years in the NHL, with 1012 games, and 263 career NHL goals. Hartikainen: Yes, exactly! Great! It was a great feeling for a game. I had a chance to play with Nuge and Ebs on the first line and every shift was against Selänne and we were in face-offs against each together and we were talking about it. I scored two goals and he scored one goal and we won 2-1. It was perhaps his last home game and it was just a really, really good feeling after that game. I will remember that game for the rest of my life. 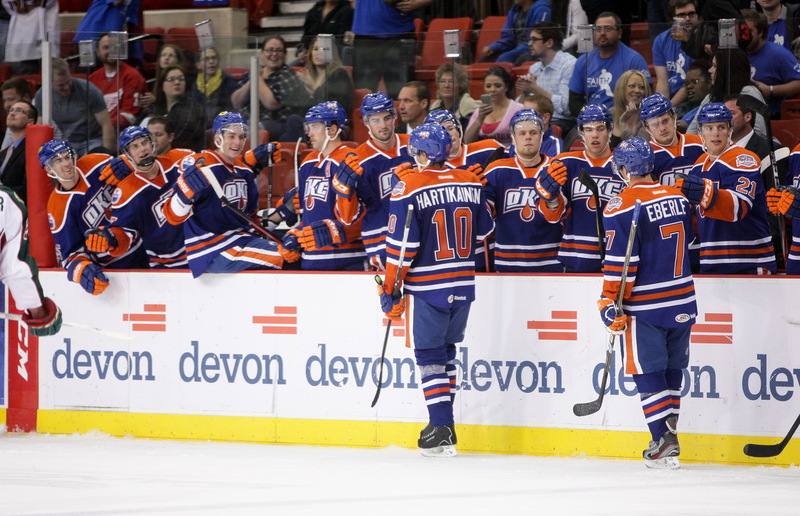 Edmonton Oilers Recap of the April 1st, 2012 game vs. Anaheim Ducks. PT: This season is very unusual due to the lockout –we have Ryan Nugent-Hopkins, Jordan Eberle and Justin Schultz down here. The past two games you have played on the top line with Eberle and Nugent-Hopkins which looked very good on Tuesday night (October 23rd vs. Lake Erie). They both said very nice things about you in recent interviews. You’ve played with them before with the Oilers. How is to be playing with them here in OKC again? And give me your impressions of your performance on the top line and the first Power Play unit the past two games. Hartikainen: It is an honor for me to play with them of course. These two guys do really well, really good passes all the time. I played with them last year in the NHL but I didn’t play power play with them and that’s a big thing for me. I need to get going, to get my ice time, to get the feeling – I’m sweating, my heart rate is up, I’m going hard, and I’m going in the corners. I’m going hard and I don’t care if somebody is coming to hit me because I’m into the game. But for playing with them, it’s making some room for them, getting good passes, giving them good passes, just throwing hits, trying to do simple things but it’s good to see that they like to play with me too. I just try to do my job and I know I don’t have to do their job and I’m good with them – if I don’t have to change anything, that’s good. PT: Who has most influenced you in the game of hockey? Hartikainen: Of course my biggest influence has been my dad. Driving me, encouraging me in every practice. In my Junior teams, he was kind of a team leader, and he made all the trips. He’s been watching all my games. While I am over here, last year I think he only missed four games maybe. My games are in the night for him, so he has to wake up at like 3 a.m. and watch the game. Then he sends me a text and says “yeah, that’s good.” Nothing big. He’s not a coach, but he knows me, knows how I’m playing and he helps me. I’ve been very thankful for him and for what he has been doing for me. He’s been very supportive. In hockey I would say in Finland I had a coach who was really hard on me but I learned a lot of things from him – what to be, and what it takes to be a really good player and how hard it is. And Sami Kapanen I played with him and he was a big influence on my hockey as well. I learned a lot of things from him, how he was playing, when I was young. And here, of course, Nelly. It’s his third year he is coaching me and he has given me a lot of trust and chances. He has been a big part of my North American experience. He’s been a big influence. PT: I always ask the guys about something fun – last year I talked to Kirill Tulupov about his workout videos, I asked Dylan Yeo about his singing, and also talked to Antti Tyrväinen about his Zamboni video. For you, I want to ask about your Finnish Hockey Team Calendar – apparently it was very popular and sold out! Tell us about that. Hartikainen: [laughing] Yes, the year before, during the summer, [my Finland team was] going to do a men’s calendar and they asked me if I wanted to do it, and it wasn’t a problem for me. I didn’t have anything to lose and it was just helping my hometown team with a picture. They actually put my picture on the internet page for my hometown team and the page shut down because there were so many people looking at the picture! It was kind of embarrassing when I saw it in the newspapers – yes, it was in the newspapers too! – I didn’t expect it would be like that at all! They were only printing 3,000 copies of the calendar and in my hometown they thought just perhaps some people would buy it, but it was huge! It sold out! They did the same thing this year but I was happy they didn’t ask me again. [laughing] But it was fun to do. When you are young, you don’t have to worry about that. PT: Who is the toughest competitor this season so far in practice? Hartikainen: Josh Green. Yes, I’d say Josh Green. PT: Who is most likely to play jokes on his other teammates? Hartikainen: Arcobello is joking around a lot. And Hamilton likes to joke around as well. We have a tight group and we joke around together. That’s good. PT: What advice do you have for the new guys on the team this season about playing hockey in Oklahoma? Hartikainen: You don’t expect it to be a fast league or a good league when you first come here but it is! It’s a tough league because you play three games in three nights many weeks and the schedule gets really hard for you. For first year guys that’s probably the biggest thing to get used to. Also, when you practice, you have to practice hard. The first year I had the problem that I played well in the games but I didn’t practice so hard every time, because, of course, you feel tired, because you play so much. But now I bring good high tempo into the practices, so now all the time I am developing my game in the practices, in the games, and I am going to the gym and doing extra work and it’s paying off. You get into better shape and you are in such good shape that you can do it – play and work hard in the practice and you come to be a better player. This year I am feeling like I’m in good shape and can play night after night, and I can still go to the gym and I don’t feel like oh my God I’m tired again. PT: You are now in the beginning of your third season here in OKC. What has been the most difficult thing about coming to Oklahoma? Hartikainen: The first year of course was the language. That was the hardest thing. I didn’t speak English very well and I learned it that first year. Of course you learn it with the guys playing and now I am feeling very comfortable with my English. I’m not afraid to speak anymore. And of course the style of the game, style of play – a different style of hockey here in North America. I feel comfortable here. There are really friendly people here and they seem to be truly friendly so it was nice for me to come here and see how nice people can be to you. They ask you in the street, how are you doing? I didn’t really have trouble coming here – the language was the biggest thing. PT: Had you ever visited North America prior to joining the Oilers/Barons in the 2010-11 season? Hartikainen: Yes, I played in World Juniors two times. PT: Have any family members been able to join you here in Oklahoma, to watch you play? Hartikainen: Last year my dad, mom, my big brother and his girlfriend came over to watch me play. And of course, my dad is watching every game from home as well. PT: How do you and the team feel about playing hockey here in Oklahoma? Oklahoma is a very focused on football and basketball so there is a great deal of competition between sports. Hartikainen: It’s good. Sometimes I wish there were more people watching the games, especially now when we have a team like this. It’s a once in a lifetime chance for Oklahomans to see these guys play here. It’s unreal right now, so many good players. So I hope more people will come watch our team. PT: Thank you very much for the interview and we are looking forward to seeing you in the NHL full-time very soon! Hartikainen: Thank you, and me too! I absolutely loved his comments about the calendar – he had me in tears of laughter. He has such a great attitude on life, hockey, everything really. I will always be a fan of his throughout his career.